Tattoo Blog » Meet Aaron Cain! Tattoo Blog » Pictures » Meet Aaron Cain! When Aaron Cain was a wee lad growing up in Pacific Grove, California, his single mom would give him broken appliances or electronics to take apart and play with. This fascinated Aaron and as he grew up, his interest in how things worked and the functioning mechanisms within machinery itself remained a constant in his life, just as art did. From his earliest days, Aaron held a fond regard and special knack for creating art. So it was no great surprise when he found himself intrigued by tattoo – an art form which combined his two loves: mechanical curiosity and drawing/designing. In his own words, Aaron had a “couple years of experimental scratching” before going the distance and becoming a professional tattoo artist in 1989. Since that time, Aaron has developed a style that is influenced by numerous tattoo artists, yet entirely his own. He works in the genre of Bio-Mechanical tattoo, and while it may not be for everyone, it is first rate art, developed by a truly original and highly creative mind. Aaron’s tattoos are a vortex of colour and parts, twisted and linked together like the innards of some sort of man/machine/beast/demon. It’s crazy stuff that completely speaks for itself. In addition to the tattoo work, what Aaron finds is taking up more of his time these days is his other art form. Painting? Nope. Graffiti? Guess again. T-shirts? No way. 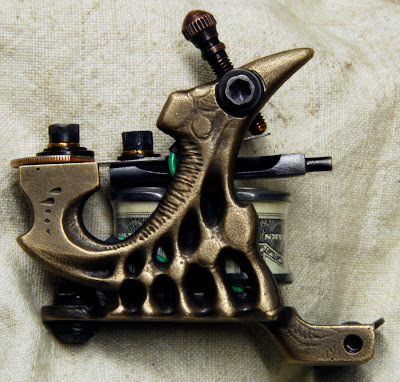 The truth is that Aaron Cain creates some very cool, one of a kind tattoo machines/guns. If you’re a tattoo artist, chances are you already know all about Aaron Cain’s tattoo machines but for those of us who aren’t tattoo artists, the craftsmanship and design of these things is still admirable. They really are works of art. Apparently Aaron was also on the TLC TV series Tattoo Wars, but I’ve never seen the show and I don’t even know if it’s still on. Regardless, if you don’t know about Aaron, it’s time to see what he has to offer.